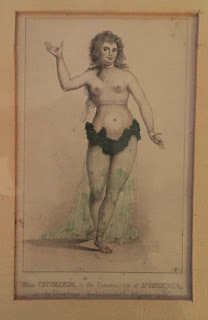 This is an antique hand colored engraving from The Life and Memoirs of Elizabeth Chudleigh, published in 1788. The inscription reads "Miss Chuldeigh in the character of Iphigenia at the Venetian Ambassador's Masquerade" which caused a major SCANDAL at the time and caught the Duke of Kingstons eye causing him to marry her. She was already married. More scandal.